So far its been a hot and dry summer and I predicted that way back after the season was over, as we had record precipation during the winter and spring. The Alley's is bone dry and the streams have been running on empty all summer. Any rain that fell has been quickly absorbed by the parched ground. During my after work runs in the metro park, the Rock struggles to flow. In the remaining pools, carp, bass and panfish have to make use of any cover available. Most of the fish seem to aimlessly swim around or are content to hide under the trees and logs just out of reach of the bucket crowd. Usually whenever the streams are that low, I'll head to the Grand for some catfish. The night before I stopped at Hienens - a local grocers that caters to the more affluent crowd and what better place to get my chicken livers from. I tied chunks of livers using spawn sac netting and I made sure they were quarter size. The kitchen table became a bloody mess as my fingers were covered in blood. I stuff a jar full of them and placed them in the fridge. The remaining liver I had leftover was left it out to stew in the heat as that was my chum. Today was no different when I woke early to see a high blue sky. I was groggy due to the fact I have been sleeping in the living room to stay cool. Sleep is hard to come by as my AC roars like a jet engine, but I'll take the deafening roar over a bedroom that feels like a sauna. It wasn't your typical catfishing day, it was a bright and the temperature at 8:30A.M was already in the 70s and sweltering. When I got the river it was barely flowing. Upstream, large rocks and boulders were scattered everywhere. I crossed over at a spot that during the steelhead season that goes over my crotch. Today, it barely reached my knees. It's been so dry that killdeers have nested and successful raised young on the rocks without any thought that one hard rain would wash their precious eggs or young away. 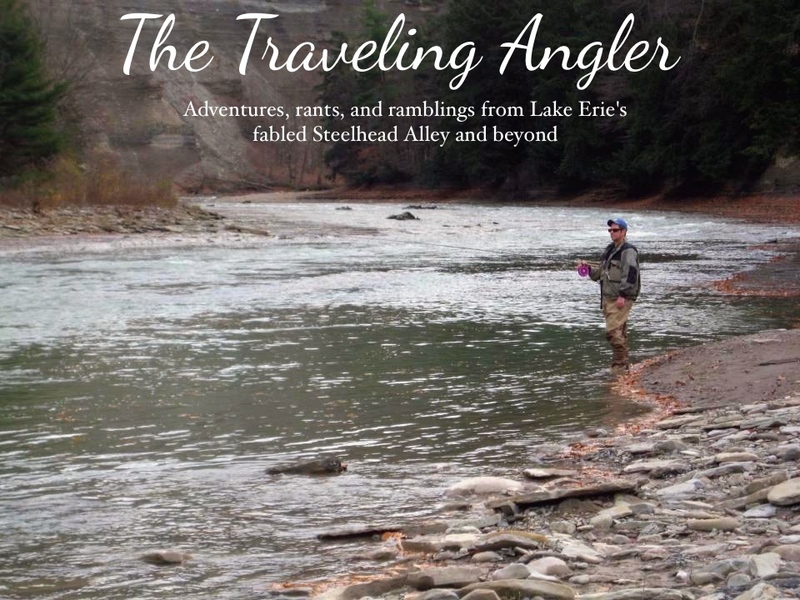 I reached a large pool that is one of most popular spot for steelheaders. There was practically no flow but the water was stained. If there was a place for catfish this was the place as everywhere else was barely 2 or 3 feet deep. It didn't take long for those livers to work as the float started popping. It kept popping and that usually means - dinks. All anglers know what dinks mean - lousy fishing. I hauled in one dink after another, nearly all of them were a little over the 12" mark. I guess pickings are slim at the bottom of the pool, because they had a voracious appetite or perhaps it was the organic non-caged chicken livers. I kept plugging away until finally the size of fish started to get larger. I guess the scent of the chum was starting to stir some of the bigger fish. Instead of the teasing taps, the float was dragged under with convincing fashion. The larger cats do give a nice fight and there have been times when I thought I hooked into a nice steelhead turned out to be a monster cat. 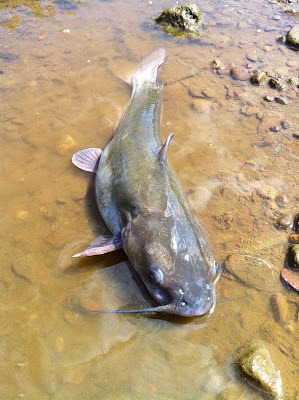 The largest one I caught to date was one that tipped the scale at 20lbs about five years ago at the LaDue reservior. It was a battle of attrition for nearly 20 minutes as I finally won out. The sun however was slowly burning me as the sweat started to bead and roll down my back. The cooler full of beer in the Jeep was beckoning me. I yanked quite a few cats from that hole but I wanted to head farther upstream. On the way back I waded out to the long run that I frequently fish. I was halfway out and I could see the bottom littered with rocks, the perfect holding place for steelhead. Hard to believe that just two months ago this river had a decent number of steelhead in it. I got back to the Jeep and I was parched. Nothing hits a parched throat than a ice cold beer. In the cooler were Brooklyn lager, one of my favorite lagers. I chugged it down and felt the dryness go away immediately. It was absolutely refreshing. I hopped in the Jeep drove to another spot up river. This was another favorite steelhead pool and the volume was half what it should be. I could make out the school of carp swimming along the logs as their golden scales gave away their presence. But I had no corn or doughballs for them. The downed trees on the opposite side would give a cat some shelter. It was more shallow so I figured there wasn't a lot of room and larger cats tend to be anti social. But now it was nearly 90F and the humidity was thick. If I caught one fish I would call it a day since I've been in the sun for almost five hours. Sure enough I was able to coax a cat out of the lumber. I managed to pull it in and noticed its caudal fin was a ragged mess. It was practically non existent and in tatters. Despite its lack of caudal fin the fish swam off in snake like fashion. Satisfied with the day's outing I made the drive home back west. Before leaving I had another beer and was plenty for tonight. I do hope this dry spell doesn't extend into fall as in past years we experienced drought like conditions well into October. Last September and October we received a lot of rain that kept the rivers up and allow some steelhead to make their way in much early. I looking forward to those days again. Agreed, Brooklyn makes some good stuff. I like the Black a lot.